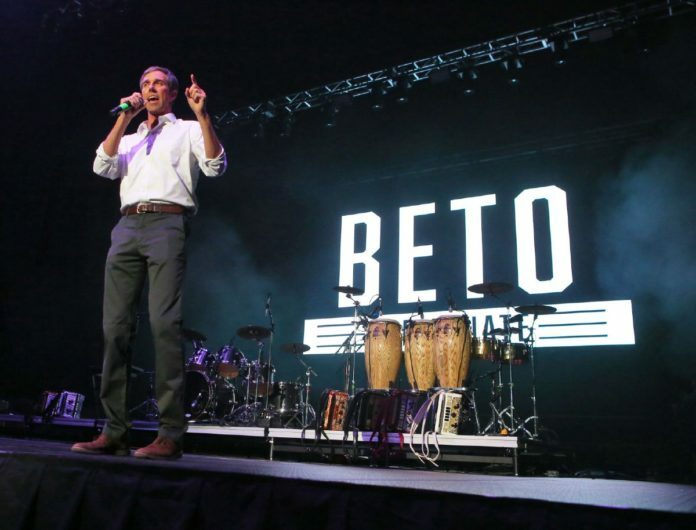 EDINBURG — Beto O’Rourke supporters and norteño fans alike filled the seats of Bert Ogden Arena Thursday night, some wearing the candidate’s merchandise, others wearing cowboy hats and boots, and many sporting both. The audience waited for O’Rourke to arrive after his nationally broadcasted CNN Town Hall at the McAllen Performing Arts Center. Or, perhaps, they were waiting for Los Tigres Del Norte, who had a free performance that night in support of the U.S. Senate candidate. Martha Green, of Port Isabel, drove an hour in traffic to get to the event. She came partly because she wanted to see the politician “that everybody has been talking about,” but also, there was no way she was missing a free Los Tigres concert. Green, a U.S. citizen of a little over a year now, said this November is her first time voting, and she’s giving her vote to O’Rourke. The issues that concern her most are health care and immigration, but what truly compels her is the amount of attention O’Rourke has given to the Valley, which has a historically low voter turnout. “I think the fact that he’s doing a grassroots campaign, that he’s getting out to see his supporters shows how much he’s willing to get into the mud and fight for us,” Krezdorn said. After a performance from Little Joe y La Familia, Hidalgo County District Attorney Ricardo Rodriguez introduced O’Rourke, who first addressed the crowd of several thousand in English, then in Spanish. He made it clear that in this election, he wanted votes from the border to matter. “This state, led by the people of the border, are going to do amazing things together,” he said. “…We’re going to decide the future, fortune and fate not just of Texas but of the United States of America.